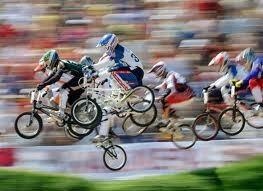 Article Body:BMX racing is a fun sport for young people. For kids, the basic bike should have 20-inch wheels. Riders under age six can use whatever type of bike they have, even if it's not a true BMX freestyle bike. These little folks might still be riding bikes with wheels as small as 12-inches. Some tracks even have races for Big Wheel bikes. A cruiser or mountain bike with 24-inch or 26-inch wheels might be okay, too, but check ahead of time with your local track for advice. Many tracks will let you race a mountain bike in the "Cruiser" class. Whatever bike you use should be equipped this way. Remove all reflectors. Take off the kickstand and chainguard to prevent injury in a wreck. The bike should have pads on the top tube, stem and crossbar. Most BMX freestyle bikes already have these pads. If your bike doesn't have them, adding this safety feature will cost about $5. The bike should have at least one working brake. A coaster brake is fine if that's all the bike has. The bike should be in safe working order. Finally, tie a paper plate to the handlebars. This will be your number plate. When you get to the track, they'll give you a number to put on it. That number will identify you to the judges and fans as you are racing. For head protection, a helmet is essential. Depending on the track rules, this may need to be a full-face helmet or a helmet with a separate mouthguard. Other tracks will accept any type of inexpensive motocross-style helmet. Wear protective clothing. Regular long pants or jeans will protect the rider's legs. For arm protection, wear a long-sleeved shirt. Since riders will use their feet, they should wear good sturdy shoes they are comfortable riding in. Although you can race without gloves, wearing them is a good idea. Be sure they fit well and don't interfere with moving your hands. Finally, bring bike tools and an air pump in case repairs are needed. To race, a potential rider needs to find a track. Local bike shops may have information on where the nearest track is. Otherwise visit the National Bicycle League (NBL) or American Bicycle Association (ABA) websites. These are the sanctioning bodies of BMX racing. They provide advice and insurance to local tracks. As an NBL or ABA member, you will have some medical insurance if you get hurt on the track during a race and do not have other insurance. A parent or guardian must accompany the rider to give permission for the child to race. A birth certificate must be shown as proof of age. Most tracks charge between $15 and $35 for a racing license that is licenses good for a year. There is also an entry fee for each race, which is usually between $6 and $10. For your first visit to a particular track, get there about two hours before the first race starts. Find the registration tent or trailer and sign up. Then take a walk around the track. Try to remember where the jumps are. Next it's time to practice. 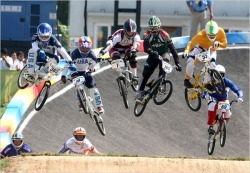 Put your helmet and other gear on and follow the others to the starting gate. Watch what everyone else does and where they go. A beginner should put his front wheel against the starting gate, keeping one foot on a pedal and the other one on the ground. Start pedaling when the gate drops. Go slow the first few times until you feel comfortable. After practice, the races will be posted. The people at the registration tent can tell you where your particular race will be posted and how the race actually works. You will be in a group or "moto" with other riders about your age. Line up with them in the staging area. When your group is called, go up and race! This will probably happen three or four times, depending on the system the track uses, and then it will be over. If you win, you might get a trophy. Even if you don't, you'll have fun.